All of us really appreciate a brilliant smile of pearly white teeth. A smile that reminds us of movies and the television stars. Unfortunately not all of us can claim to possess such a smile, and any effort to whiten teeth only results in the plummeting of our earnings, due to costly dental treatments, or unsuccessful treatments misleadingly promised by teeth whitening products. Is it that difficult to obtain a sparkling white smile? 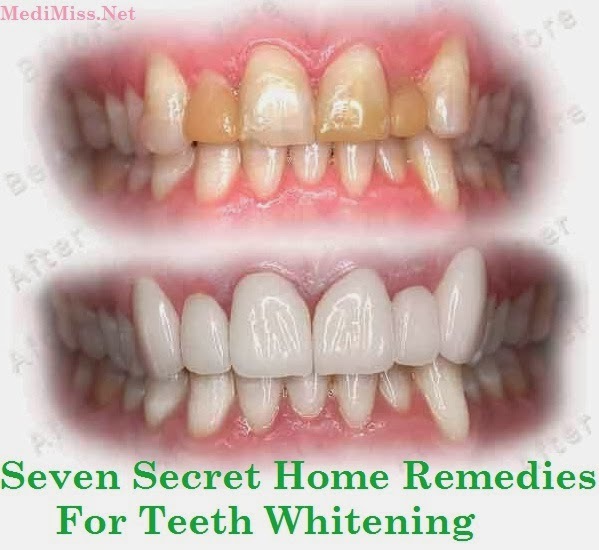 Not only is it easy, it is also very cost effective if you opt for home remedies to whiten teeth, and you may choose from many different types. 1. Peroxide and baking soda paste. Mix 2 teaspoons of both hydrogen peroxide and baking soda to obtain a paste similar to the texture of toothpaste. You can give it a better flavor by adding a bit of mint or toothpaste. Apply this paste like you would regular toothpaste and leave it on for a few minutes. Use it no more than twice a week. 2. Baking soda and lime juice paste. Mix some baking soda with a few drops of lime juice and apply this paste on the stained teeth, massaging gently. This paste is a great stain removing treatment. 3. Orange peel. A safe and effective way to remove stains from your teeth is by rubbing the inside of an orange peel directly on your teeth. This method is by no means abrasive and will preserve the enamel. 4. Lemon juice and salt paste. This is another good homemade remedy to whiten teeth. Mix a teaspoon of both lemon juice and salt to make a paste, which is excellent for removing stains. This paste should not be used too often, for the acid content in the lemon juice can be abrasive for the enamel. 5. Baking soda and hydrogen peroxide paste. Mix a small quantity of the two products together to obtain a past and apply it on your teeth as toothpaste. This homemade remedy is very effective for teeth whitening and will reduce discoloration and bring back the brilliance in your smile. Make sure you use this paste no more than twice a week, and be careful not to swallow it. 6. Extra virgin oil rub. This is a simple homemade remedy to whiten teeth. After brushing your teeth with regular toothpaste, apply virgin olive oil with a cloth and rub over your teeth. 7. Crushed strawberries. This is a natural teeth whitener solution, for strawberries contain enzymes whiten teeth naturally. Simply crush the strawberries and use this preparation as you would toothpaste. These are a few straightforward home remedies to whiten teeth, which you may use regularly. It is nonetheless important to avoid an excess of external agents, such as tea, coffee, wine or nicotine, which aggravate the staining of teeth. Also use peroxide with care, for excessive use can cause sensitive gums and damage the enamel of your teeth.